It's congratulations to PCC 'C' - League Champions! An unexpected home defeat for PCC 'B' today, handed the 'C' the SCF Handicap League North title today. High Wycombe in to a 'must win' for the 'B'. had just too much for PCC 'B' who slumped to their second loss of the season. with a draw against Dogmersfield seven weeks ago. four doubles and all the first round of singles games to boot. At 0-8 down, it became a damage limitation exersize and Raymond Wood's team did show good sprit to win all four of the remaining singles, but it was too little to late and the match, and the title had gone. PCC 'B' had won the league title for the previous two years, since its inception in fact, and last year went one better by winning the play-off with the Southern winners to claim the full SCF handicap title. But it will be PCC 'C' who go forward to that play-off on Tuesday 16 September at Winchester with the hope of keeping the League Cup in Phyllis Court hands. PCC 'A' got the better of Ryde today in a level match for the first time that anyone could remember. We fielded a 0, 2, 2 and 3, whilst our opponents mustered a 1 and three 2's. In the morning Chris Roberts and Mike Fensome won the first and lost the second games of their doubles rubber, and the decider was 'put on hold' to be played only if the result of the fixture depended on it. Helena Fensome made short work of her opponent in two quick singles games but Pam Mead lost in three. With the match evenly poised at lunch, it looked odds on that the doubles decider may have to be played after all, but three tough afernoon singles rubbers (all went to three games), from Roberts and the two Fensomes wrapped up the tie by 4.5 points to 2.5. Ryde brought eight more players for a friendly fixture to run along side the league match and our visitors ran out winners 7 - 9. 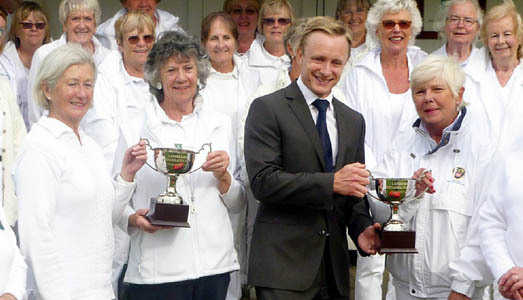 Delia Norris was the surprise winner of the second Ladies Championship Singles today. She won all five of her games in the Swiss format tournament, in which players face opponents on the same (or similar) number of victories in subsequent rounds. By the end of the fifth round she couldn't be beaten (as even a loss in a sixth round would have given her the title on the 'who beat whom' rule). Eleven Ladies played the whole tournament and we are indebted to Mary Chambers, who at 9pm the previous evening, agreed to fill in for a couple of games in the morning to even up numbers at least for the first two rounds. 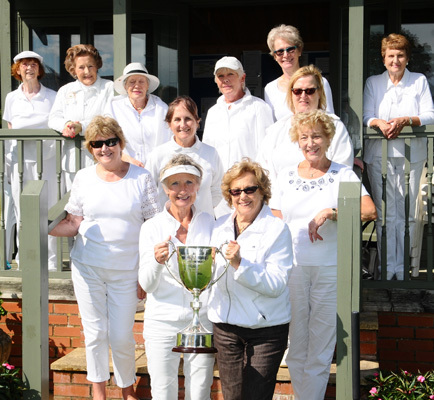 Delia is the second winner of the magnificent Ladies Championship Trophy donated by Rosie Richardson, who was courtside all day and generously hosted everyone to refreshments during the day and drinks on the terrace afterwards. Our lovely One Ball trophy will have a new name on it this season after Raghu Iyer won the afternoon's annual tournament. Raghu made good use of his bisques to beat all that came before him, recording a convincing +7 win over Chris Roberts in particular, who, as in a GC encounter a few weeks ago, couldn't live with the number of bisques conceded. Others made a better job of defending the bisques but when Raghu defeated Ian Norris in the fifth round, he took an unassailable lead over the other six players, rendering the planned final round unnecessary. Raghu's ball placement and subsequent hoop running, was very accurate this afternoon, was the key to his success and congratulations to him. Will Raghu and Dianne do likewise on Sunday? Roger Goldring was surprised to qualify for the National Final at Surbiton today. He won two of his four block games (losing the others by just a point each time) but this was enough to sneak a qualification for the National Final on the 'who beat whom' rule. Roger went on to finish seventh on the day and will be as keen as anyone to see if Raghu Iyer and Dianne Brown can also qualify from their heat at Hamptworth on Sunday. handicap tournament (the Black Ball) earlier in the year. Smokey Eades was on hand to present his cup to a PCC visitor for the first time today, when Richard Raby won our two-day National B-Level Series tournament. He is the first visitor to claim the prize following victories by Ian Norris last season and Raymond Wood in the inaugural year. 16 players from 8 different clubs including a PCC quartet took part, with visitors returning from Hamptworth, Leighton-Linslade, Gulidford and Hamptworth and we welcomed a newcomer too: most impressively, a young man all the way from Durham. Raby was the class act over the two days, won my two clear victories from his nearest rival and indeed looked like completing his 15 games undefeated, right up until the last when top seed David Ball ran a 20 yard hoop to dent his record. Of the PCC players, Roger Goldring and Dianne Browne did extremely well from the bottom of the rankings to record 7 and 5 wins respectively and both reduced their handicaps as a result: while Richard Peperell and Harry Midgley both played to par. 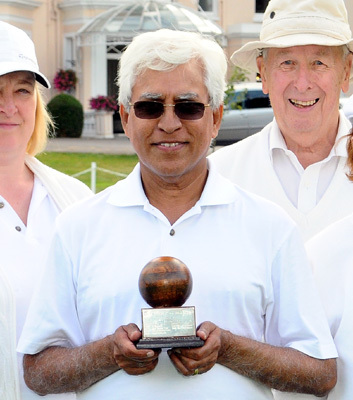 17 August 2014 - Dianne Browne & Raghu Iyer will join Roger Goldring at National GC Handicap Finals! 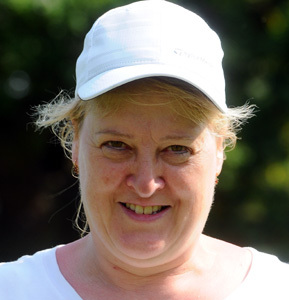 Phyllis Court will have the largest representation of any club at the finals of the All England GC Handicap competition, after both Dianne Browne and Raghu Iyer qualified at Hamptworth today. They join Roger Goldring who qualified earlier this week at Surbiton (see 12 August news item below). Raghu was undefeated in his block matches but Dianne only snuck her qualification on a tight hoop count in her block; however she did then go on to win today's Area Final for good measure. So it's congratulations to the PCC trio who will play at the National Final at Pendle in Lancashire on 20 & 21 September. PCC 'A' rounded off their league season with a resounding 7-0 victory at Littleton today. Although the score suggests otherwise, our team didn't have everything entirely their own way as Littleton's mid-handicappers put up a good fight. Only Helena Fensome failed to drop a game during the fixture, while Chris Roberts, Ian Norris and Mike Fensome all got caught by a higher handicapped home player before recovering to win their matches eventually. This victory ends and 'up and down' campaign for PCC 'A', the highlight being the recent victory over nemesis Ryde and the low mark, the unexpected defeat at High Wycombe. - At home today, Raghu Iyer captained a PCC 'Firendly' team who were narrowly beaten by 7 - 9 by Blewbury, on a lovely afternoon which saw a number of PCC players representing the club for the first time. Mike Fensome and John Stanner teamed up to play the most consistent croquet today and win the Ian Lindsay Cups for the first time as a pair. Fensome famously won this, our top GC doubles tournament of the season, with Sylvia Thomson back in 2011, and has had success before in with Stanner in winning the 5+ Cave Wolfe tournament (twice), but this was something new for the two tennis aces. In fact they are the first 'all male' piar to win this event since Hugh Spensley and Lionel Wilding turned the same trick in 2002! A healthy 12 pairs, covering all handicap ranks, contested the 2014 event and the five rounds of games in the two blocks were keenly contested either side of lunch. 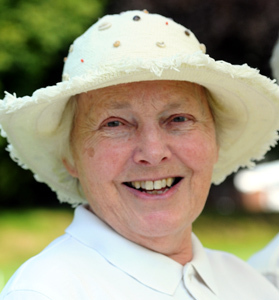 Fensome and Stanner beat Chris Roberts and Frances Colman in to second place in their block, while Ian and Delia Norris won the other one ahead of Helena Fensome and Pam Mead. The two winners played the opposite runners-up in the semis, with Fensome/Stanner seeing off Fensome/Mead and Roberts/Colman scraping through against the Norrises on the last hoop. So the final was a repeat of the earlier block game and Fensome/Stanner undid Roberts/Colman with some very accurate ball placement and hoop running. The winning shot came from Stanner (just how good could he be if he were to play a bit more?) who sunk the 10th hoop from fully 22 yards! It was lovely to see Pauline Wilding again on hand to present Iain's Cups to the very worthy winners - very well done chaps! Raghu Iyer reports: This year there were only five contestants for the AC Autumn Singles tournament, as Brian Bucknall was ill health and others were not available to play this weekend. The Senior event was based on 18 point games with a time limit of two hours and 'all play all' (a format that was very much enjoyed by all players). Elizabeth O’Dair won 3 of her 4 games and was declared Champion; her wins included a 18-1 victory over Harry Midgley, who was not given many opportunities to make a break in this match! Harry and Raghu Iyer both won 2 games each, but as Harry beat Raghu in their match, he was the runner-up. In the Junior event, only two of the four beginners Pauline Wood and Joanna Iyer competed in a best of three 14 point games, time limited to 1.5 hours, with each player enjoying 9 bisques. As expected, it was a very close contest that Joanna managed to win 7-4, 7-6. Both players enjoyed playing this short format of AC, which ought to be attractive to possible interested GC players. Elizabeth and Joanna were presented with their trophies by Harry Midgely, and as it was his birthday, he bought a round of drinks for everyone at the end of a very enjoyable day indeed. Frances Colman won her class at the Croquet Association's historic Challenge and Gilbey AC Tournament (first contested in 1907) today, with a game to spare. 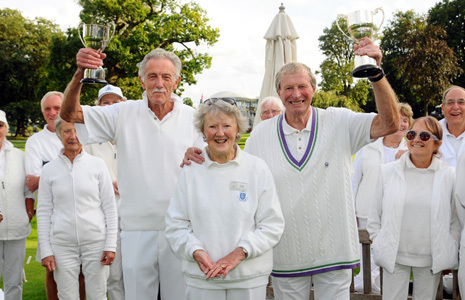 Amongst others, she impressively beat the President of the CA, and the CA's head of handicapping on the way to collecting a lovely solid silver cup at Sussex County Croquet Club, and then lined up with the other class winners for this photo. News has filtered through that Helena Fensome and Pam Mead won Thames Valley CC's Ladies Doubles tournament earlier this week. Helena scored an improbable double of the 11th & 12th hoops in one single long shot (!) to score the vital winning points in the final. Fellow PCC members Delia Norris and Diane Brown got to the semi-finals and Anne Attfield (who enjoys joint membership) also took part.